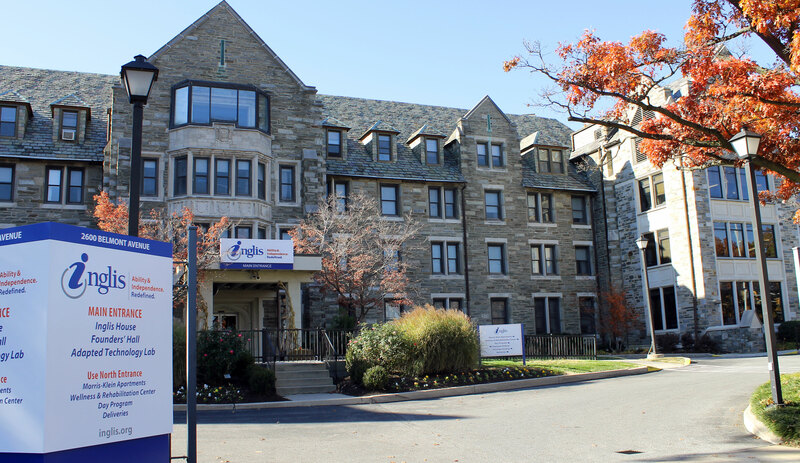 Inglis House is a skilled nursing, long-term care community, based in Philadelphia. Founded in 1877, Inglis specializes in services to adults with severe neurodegenerative physical disabilities resulting in paraplegia and quadriplegia. The 252 residents — all wheelchair users — range in age from 20 to 90 (average age 47). Their primary diagnoses a range of neurological and musculoskeletal disorders such as multiple sclerosis, cerebral palsy and spinal cord injury. In 2011, Inglis formally launched a multi-year initiative to transform Inglis House and adopt a Person-centered care, home-like community. Person-centered planning is a process, directed by an individual with long-term care needs, intended to identify the individual’s strengths, capacities, preferences, needs and desired outcomes. The process includes participants freely chosen by the individual who enables and assists the individual in identifying and coordinating a personalized mix of services that will achieve his/her desired outcomes in the most inclusive community setting. Person-centeredness empowers residents to make their own decisions about when to get up or go to bed, how to decorate their room, assist in menu planning and participate in household decisions. Staff and residents work together in a collaborative, home-like setting to set the tone and activity level for their Neighborhoods. Inglis House has been transformed from an institution to a more home-like community, based on the concepts of Person-centered care – a community of people, living and working together to create lives of purpose, meaning, worth and happiness. Neighborhoods, formerly referred to as nursing units, are organized and operated through shared planning and decision-making by residents and staff. In addition to providing medical and personal care, a key aspect of serving younger adults is recognizing that they typically have a wider range of needs than a geriatric nursing home resident. Younger adults, whether congenitally disabled or disabled later in life, struggle to achieve goals that give a sense of autonomy, mastery, and creativity. Those disabled unexpectedly as adults often find their personal relationships undergo abrupt and traumatic changes, especially relationships with romantic partners, children or grandchildren. Inglis House provides a range of medical, personal and enrichment services that enable residents to live life to the fullest. Inglis House is recognized as a “Center of Excellence in Long-term Care” by the National Multiple Sclerosis Society for its excellent clinical care and quality of life programs for people with physical disabilities — one of only 10 organizations in the country to receive this important designation. Inglis is one of a select few residential facilities throughout the United States that offers such highly specialized, long-term care for people with physical disabilities. Inglis is a skilled nursing facility that offers the nursing/medical services in a home-like an environment. Here, residents are encouraged to be as independent as possible. Inglis focuses on the entire person, not just a medical diagnosis. We work to help residents reach their goals all while receiving the services they need. Some of the medical and nursing services available are explained below.